What is the avast! AutoSandbox and how does it work? 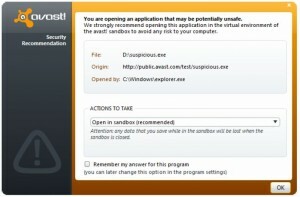 Question of the week: A new program I downloaded was put into the Sandbox by avast!. What is a Sandbox and how does it work? The avast! Sandbox is a special security feature which allows you to run potentially suspicious applications automatically in a completely isolated environment. Programs running within the sandbox have limited access to your files and system, so there is no risk to your computer or any of your other files. This feature is connected to the FileRep cloud feature which identifies new files for additional analysis. So now we are able to warn you even before we have had the opportunity to examine this malware in our Virus Lab. Here’s how it works: By default, if an application is started and avast! detects anything suspicious, it will automatically run the application in the Sandbox. The advantage of running an application in the Sandbox is that it allows you to check suspicious applications while remaining completely protected against any malicious actions that an infected application might try to perform. The browser or other application will then open in a special window with a red border, indicating that it is being run inside the Sandbox. When the Sandbox is closed, it will be restored to its original state and any downloaded files or changed browser settings will be automatically deleted. You can change the AutoSandbox settings, so that avast! will ask you first before putting an application in the Sandbox. In the settings, the AutoSandbox can also be disabled completely, or you can specify any files or applications that should be excluded and never run automatically in the Sandbox. In the “Browser Protection” tab, you can further specify that your browsers should always be run in the Sandbox to ensure you are protected while surfing the web. To learn more about the AutoSandbox, please read our previous blog, AutoSandbox – why are you annoying me?